Charles James was a man of restless, unpredictable and unorthodox creativity. It almost wasn't in him to create the same fashion twice, and there was no knowing what his next garment might be except that it would be an unforgettable, utterly original amalgam of mathematics, architecture and sculpture. And it would be made of rich delectable fabrics - usually yards and yards of them - tucked and draped and seamed with utter precision often over rigid underlying corsetry of his own invention. Although James inspired and fascinated generations of designers, admirers and collectors, his name is not generally known. He was prominent for less than 10 years (1947-54 in New York) and his total output was fewer than one thousand garments in his entire fifty year career. 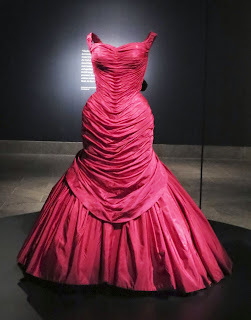 One of these garments is the striking "Tree" Ball Gown of 1955 designed for Marietta Peabody Fitzgerald Tree. Yesterday Ciwt how the gown is able to stand on its own. It turns out there James invented many hidden solutions to this defiance of gravity including zippers, bone, weights. The gown's embedded structure likens it to standing sculpture. Halston himself referred to James as the Leonardo da Vinci of fashion. He was far more interested in the construction of his clothing than the comfort. Looking as the yards and yards of fabric* and thinking of of the rigid seaming, zippers et al, Ciwt does not envy Mrs. Tree wearing her gown. * There is even more fabric than meets the eye. When Mrs. Tree walked, white satin facing supported by a profusion of colored tulle added romance to the visuals - and more weight for her.